BLAIRSVILLE, PA � It�s always nice when someone takes a good thing and makes it better. It's straight down to the green of the par three 2nd hole (152 yards) - and you must fly over some power lines as well. You have to admire the American entrepreneurial spirit � the sense that �good enough� isn�t always the end-all when it comes to a product you�re offering to the public. That �make it even better� approach was the thinking behind adding the Tom�s Run golf course to the existing Chestnut Ridge Golf Resort in Blairsville, Pennsylvania � located about an hour�s drive east of Pittsburgh on the edge of the Laurel Highlands. 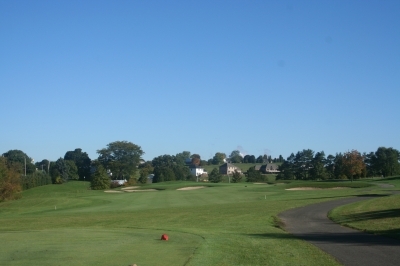 The original Chestnut Ridge course was built in 1964, and for three decades offered players in the region a pretty solid 18-hole track to make their golfing home. But there was a sense from the owner at the time that they could do even better, and that they could take a good thing and improve on it � just what Americans have been doing since they landed on the North American continent. Hence, the idea to build Tom�s Run was born, and the results all these years later prove that it was worth the effort. The short par four 12th hole (314 yards) tempts you to try and get your tee ball close to the green, but there's plenty of trouble waiting if you're not accurate. In other words, Bearer (who has since passed away, and the property has new ownership) dreamed of making Chestnut Ridge into the best public facility in the region � thank God for visionaries. Bearer also wanted to develop a housing community in conjunction with the new golf course, so there were additional reasons to expand. Players who visit Tom�s Run these days are fortunate to see the end result of the vision. Tom�s Run opened in 1994, and has been pleasing locals and visitors ever since. The 'signature' par four 5th hole (326 yards) is nicely framed by hardwood trees, and the bunkering suggests where you should place your tee shot. 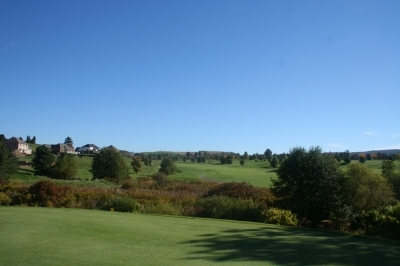 Bearer himself did not play golf, but had a natural vision for the way a golf course should fit the land � and he also owned an earth moving company that was instrumental in grading the property to achieve the necessary results. It never hurts to have the right tools at your disposal, after all. 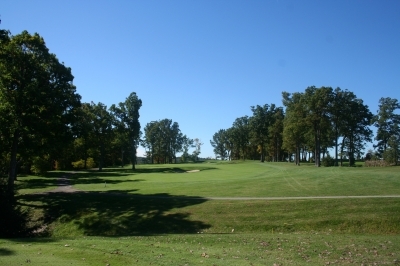 Part of Tom�s Run�s pleasing nature stems from its built-in variety � the holes occupy two distinctly different types of terrain, which is great for golfers, but presented a problem for the technical golf course building brains who needed to figure out how to work both landscapes into the layout and make it all mesh together. 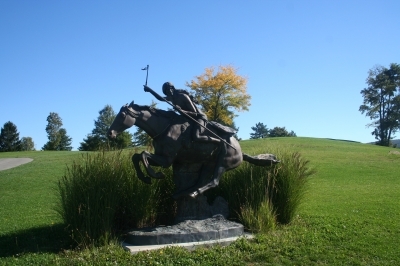 One of Chestnut Ridge's unique features is a number of statues situated throughout the course. 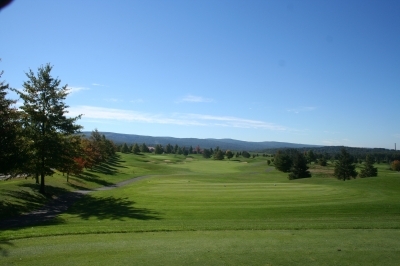 Tom�s Run (the stream from which the course gets its name) also figures prominently on the lower part of the property � it winds through the valley, and together with the rock bluffs, provides a very distinctive setting for the golf holes. Sure enough, the opening portion of the course moves towards, down, through, and then up the little valley Love was describing. It�s a scenic thrill-ride, with some golf thrown in � highly satisfying, all around. But the valley section was hard to incorporate into the master plan, at least at first. Other issues included working around the existing golf course, starting and finishing the new course at the clubhouse, working within a reasonable budget and making sure the environmental details were attended to. There's plenty of trouble short of the par three 8th hole - water and sand guard a long, narrow green. The difficulties were nothing that couldn�t be overcome, thanks in part to Love�s creativity. The routing issue was solved by a decision to make Tom�s Run a continuous 18-hole course without returning to the clubhouse after the front nine. �There wasn�t much room around the clubhouse for starting and finishing holes, so we thought the course would do just as well by flowing uninterrupted for 18 holes, as an upscale resort course would,� Love said. 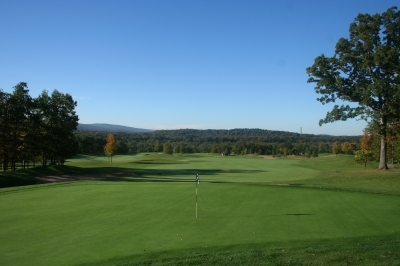 The existing Chestnut Ridge course helped in that respect, being already available for 9-hole rounds and league play to serve different types of needs. Bunkers guard the corner of the dogleg left 17th hole, but there's a wide fairway to the right if you'd like to play it safe. So in other words, there are actually 21 90�s-vintage holes at Chestnut Ridge � talk about improving on a good thing. And the beauty of the property isn�t the only thing that�s striking about Tom�s Run. From several spots on the course you have long range views of the picturesque surrounding countryside (Packsaddle Gap), making it a scenic wonder as well as a really fun place to play. The view from in back of the par four 7th hole - the scenery is breathtaking. When talking about stream protection, that usually means significant land buffers, and even installation of man-made wetlands to further insulate the water from golf�s sometimes harsh intrusions. None of these considerations are visible to players on-site, which just goes to show that proper care was taken at the time of construction. That�s a good thing. Another problem Love faced was how to transport players down to the lower portion of the property (at the par three 2nd hole), and then bring them from the fourth green in the valley up to the fifth tees, which essentially would require scaling a steep rock bluff. Luckily for golfers, there were answers here as well. The most visually intimidating tee shot on the course is found at the par four 3rd hole. From the back tees, it looks like a long carry (it isn't) and a fairly narrow landing area. In the golf sense, the problem was solved by making the second hole a par three with a tee shot that literally falls down into the valley. But how to get the players down there after teeing off? Love�s right � it is quite a journey on that bridge, just one of many things that makes Tom�s Run memorable. It doesn�t hurt that the golf course is first rate, even apart from the scenery. 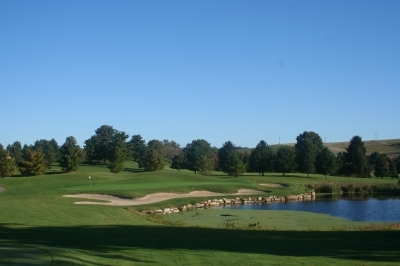 The course contains eighteen distinct holes, each offering its own strategy and challenge. The variety of topography of the holes augments the strategy of the course without making it gimmicky or uneven. Looking back from the green of the par five 13th hole - you can see there's plenty of room for resort players to have some fun at Tom's Run. Naturally, playing the course is just as important as looking at it � and Tom�s Run is a fairly gentle resort-style course that won�t punish you severely for missing the target (though the valley holes are pretty tight). At just over 6800 yards from the back tees, it�s a fair test for better players, and moving forward to the white tees makes it enjoyable for duffers of all levels. And since the course is pretty wide open on the �upper� portion of the property, the wind is often a factor. Racchini says the swirling winds are routinely 10-15 mph, which plays havoc with club selection. The long (619 yards) par five 9th hole seems like it goes on forever, but with views like this, it's sure an enjoyable trip. The day we played it was dead calm, but I can see what Racchini�s talking about. There aren�t a lot of carries on the course, but a couple of the long holes would be darn near impossible if played into a stiff wind. Hole highlights on Tom�s Run include holes 2-4, the �valley� holes that Love was describing earlier. The second hole measures 152 yards but plays much shorter due to its downhill setting. The par four third hole (359-yards) features the course�s most intimidating tee shot, as you�re shooting over wetlands to what looks like a fairly narrow landing area. The fourth hole is a relatively short (492 yards) risk-reward par five that could offer a good birdie opportunity to those who can keep it in play. A modest carry greets you off the tee of the par four 15th hole, and at 469 yards, you'd better get some air under the ball if you hope to reach the green in two. The back nine is a completely different aesthetic experience, with very few trees to influence play, and the elevation changes are subtle and rolling. 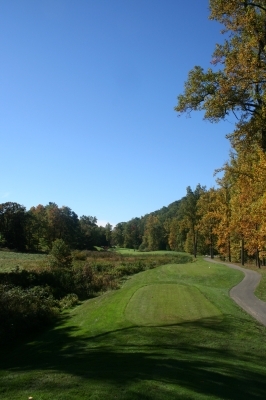 The most difficult hole on the course (#2 handicap) is the 469-yard, par four fifteenth hole. It�s a slight dogleg left that will require some risk off the tee to try and cut off some distance on your second shot. 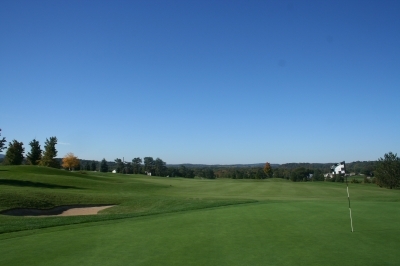 A final noteworthy aspect of the Chestnut Ridge/Tom�s Run experience was the course conditions � simply put, some of the best we saw all season. Chestnut Ridge has acquired a well-deserved reputation for great playing conditions, and it was certainly true on the day we visited. 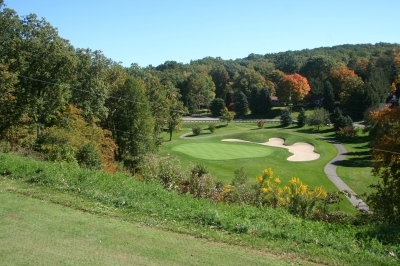 Taken in total, the Chestnut Ridge Golf Resort is certainly worth visiting if you�re heading to western Pennsylvania. The service was plentiful and attentive, the courses were well marshaled, the playing conditions were outstanding and the price was right for what you get. We didn�t sample the food when we were there, but we heard it�s pretty good! 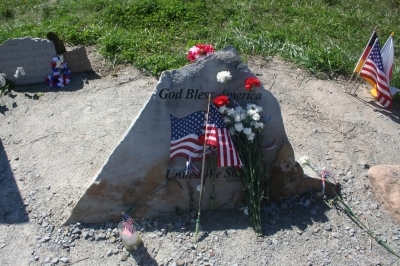 The United 93 crash site helps us all remember those who sacrificed for our freedom. Chestnut Ridge is the type of place you could build a trip around � and now there�s even a hotel on property to get some sleep and store your clubs when off the course. It just goes to show, it�s definitely possible to take a good thing and make it even better. On the way back from our trip to western Pennsylvania, we stopped at the Flight 93 crash site. It was a sobering and humbling experience, and certainly brought back memories of that tragic day in September of 2001. At the time we visited, there was no formal memorial to the citizens who perished on the plane, and the actual site itself is well away from the viewing area � no matter, the aura of what happened there is all around, mostly found in the personal memorials left by people who�ve stopped by over the years. If you�re going to be in the area (about 60 miles southeast of Pittsburgh), I would highly recommend visiting the site, for a little perspective on the important things in life, and to honor the sacrifices that the passengers and crew of Flight 93 made for our security and freedom. For those of us residing in the Washington area and who have loved ones working on Capitol Hill, we can�t thank them enough. They�ll never be forgotten. You�ll also get a chance to learn about the efforts being made to build a permanent memorial at the site, which is probably still several years away. 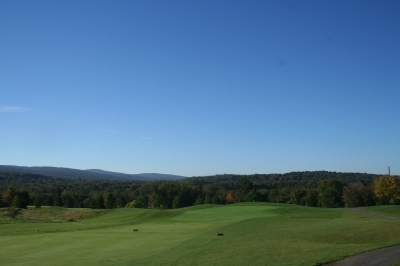 Notes: Walking is allowed on the Chestnut Ridge course, but not on Tom�s Run, due to the elevation changes. The Ramada Inn Historic Ligonier is situated in the heart of charming historic Ligonier in Pennsylvania�s beautiful Laurel Highlands. Cozy doubles, deluxe kings, and various suites are available for families, corporate travelers, or even the bride and groom. The hotel offers casual dining and cocktails in the relaxing atmosphere of the Bistro, an outdoor heated pool, and a fitness center. Within walking distance are more than sixty specialty shops and historic Fort Ligonier.